Great-grandchildren, Lane and Lennox and numerous cousins and extended family. The family will receive friends on Saturday, December 1, 2018 from 10:00 am to 11:00 am at St. Mary’s Catholic Church. The funeral mass will follow at 11:00 am with Rev. Brent Shelton officiating. A reception will follow at the church. The family wishes to extend a special thanks to the wonderful, caring nurses with PCM and U. T. Hospice. In lieu of flowers memorials can be made to the St. Vincent DePaul Society in care of St. Mary’s Catholic Church, 323 Vermont Avenue, Oak Ridge, TN 37830. Weatherford Mortuary is handling the arrangements. An on-line guest book can be signed at www.weatherfordmortuary.com. To send flowers or a remembrance gift to the family of Roger William Wiegand, please visit our Tribute Store. 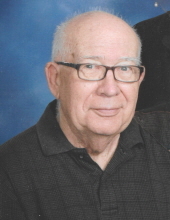 "Email Address" would like to share the life celebration of Roger William Wiegand. Click on the "link" to go to share a favorite memory or leave a condolence message for the family.